After going 1-2 in cross country, the Class 3 Freshman duo of John Burroughs' Kylie Goldfarb and Christian's Mercedes Schroer were back for more state medals this spring. In particular, they were back for more gold and silver. In the first girls distance event of the day, the 1600, Fatima senior Brianna Haller took the lead from the gun and went for her second straight 1600 title. She pulled the group through in 2:33 as Goldfarb, Schroer, Fatima's Alyssa Struemph, St. Michael's Caroline Meyers, and Bowling Green's Kate Klott all sat two seconds behind her. Goldfarb and Schroer made the break and separated as Haller pulled them through 1200 and it became a three horse race. With 200 to go, it was the two freshmen as Goldfarb had taken the lead, but with 50 meters to go, Schroer made one last push to grab her first career state championship. The Christian high soccer player is still in the midst of the playoffs on the pitch, but she was able to take some time out to go 5:09.15 and hold off Goldfarb in 5:09.88. Haller came across in 5:14.43, tying her personal best to the 100th of a second. Later in the day, Schroer and Goldfarb were back in the 800 to duke it out once again. This time, Goldfarb would hold Schroer, running 2:17.25. Schroer went 2:18.54. 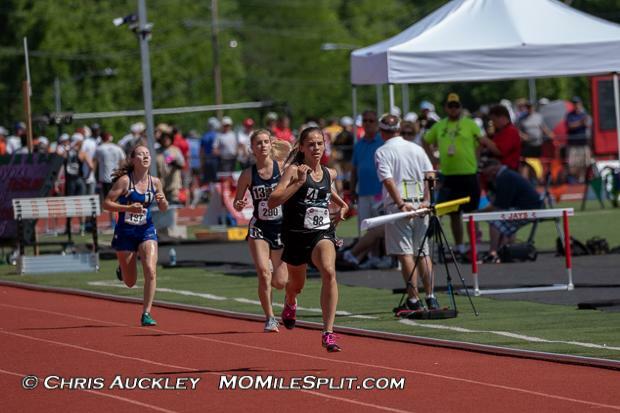 Returning state champion Kinsey Sorrell took the race out in 65.37 and ran a personal best 2:19.58, but was unable to repeat this year with the freshman phenoms grabbing the top 2 spots. 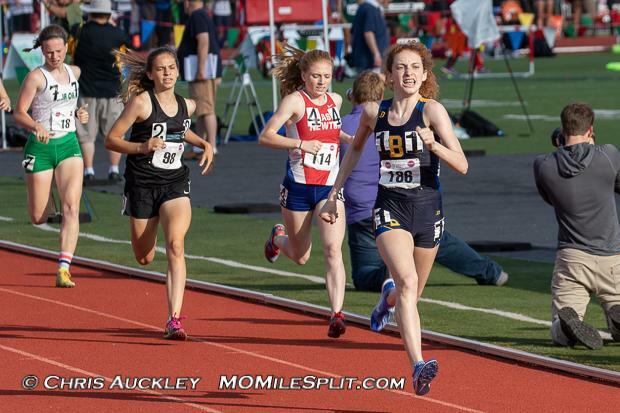 Kylie Goldfarb was on fire this weekend as she was able to anchor her John Burroughs teammates to a championship in the 4x800 Saturday morning, too. Her 2:15.60 was the only split under 2:20 on the day. Schroer anchored her squad to a 9th place finish with the second fastest split - 2:20.47. Schroer was equally on fire this weekend as she would go on to sit and kick to the win in the 3200, as well. Her final lap of 77.49 was the biggest key to the win as she was able to once again finish ahead of the reigning state champ Haller. 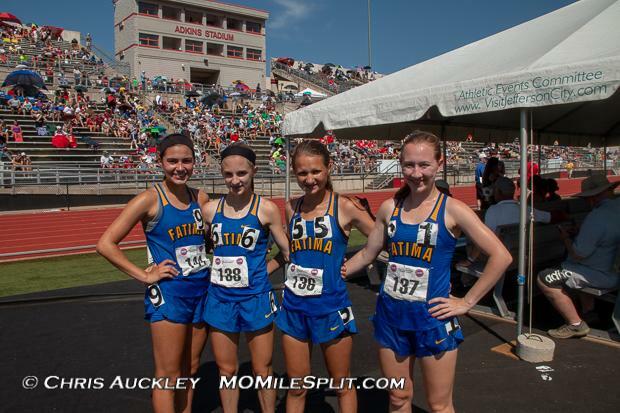 Speaking of the 3200, the girls from Fatima pulled off a feat not often accomplished as the put four girls on the podium in the two-mile. 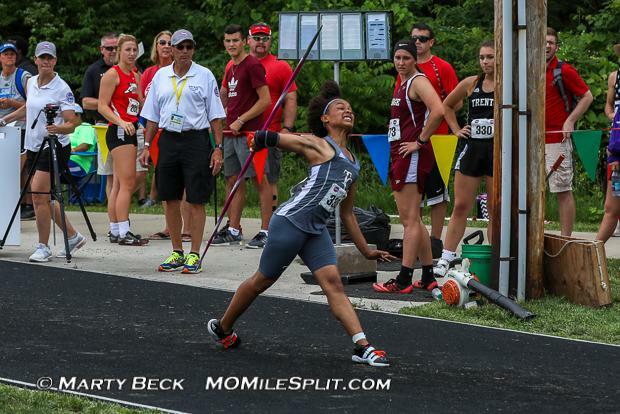 In order to qualify more than two individuals for an event, all athletes must run, jump, or throw a mark under the qualifying standard set forth by MSHSAA. 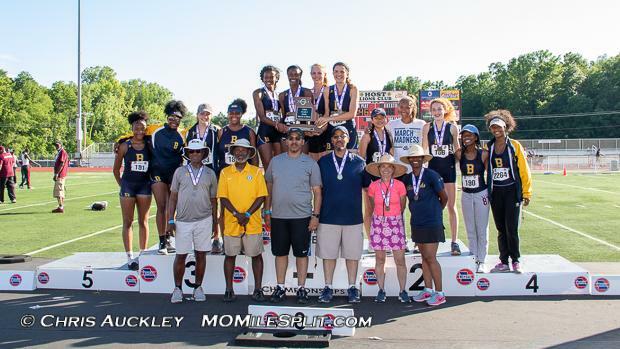 A team can have as many athletes qualify as they want for the district meet, but the athletes still have to get top four in each of the district and sectional meets in order to make it to state. The 3200 seems to be the hot commodity the past few years as Lafayette qualified four boys to state in the 3200 in 2016, as well, scoring only three of them. On Saturday, Brianna Haller led her teammates to the 2-3-4-7 finish with sophomore tandem Alexis Fischer (11:48.47) and Kendall Haller (11:49.90) finishing just behind her 11:31.08 and junior Alyssa Struemph taking seventh in 12:03.05. Cardinal Ritter and Trinity Catholic's girls duked it out all weekend in both the relays and open events. Cardinal Ritter won all three sprint relays while Trinity finished second in the 4x200 and fourth in the 4x100. 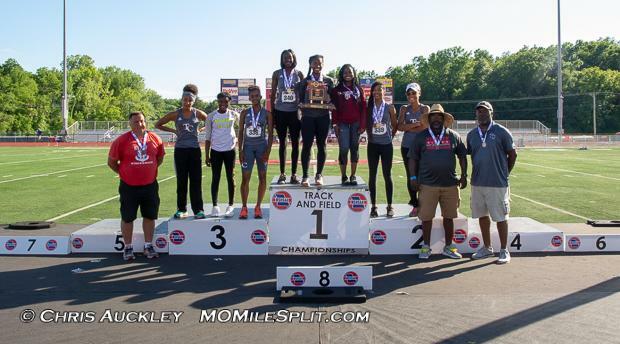 The Ritter squad of Sydney Mitchell, Mecca Hamm-Bey, Teriona Gurlly, Breonna Gregory, Valarie Whitted, Kristin Booker, Adrean Merriweather, and Shayla Davis combined forces to bring home the relays dominance for the Lady Lions. Trinity's big points came from the individual events, though, as Deayvion Smith won the 400 and took sixth in the 200. Sydney Juszczyk, mentioned next, won the javelin, but also took sixth in the triple jump and second in the 100 meter hurdles to Ritter's Whitted. Shaila Jones took third in this one for Trinity and Shayla Davis was fourth. 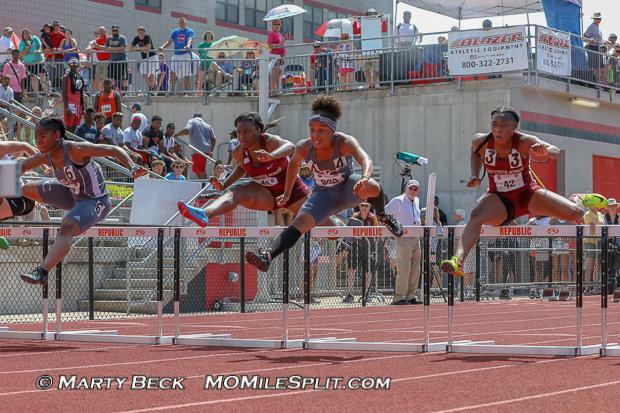 The top four girls in the Class 3 100 Meter Hurdles were from Trinity or Cardinal Ritter. Shayla Davis also took third in the 300 meter hurdles with Trinity's Samantha Sieve taking seventh. Sieve also finished eighth in the high jump. Cardinal Ritter picked up an advantage in the long jump with a second place finish from Sydney Mitchell. These two teams would finish second and third because of John Burroughs' distance advantage, but showed that St. Louis is still no joke when it comes to the sprints. The AAU National Champion in the javelin, Sydney Juszczyk made her presence felt earlier this season at the Ladue Brusca/Strobach Invitational with her US No. 4 mark of 161-8. This throw is also 12 feet clear of the next best freshman in the entire country. 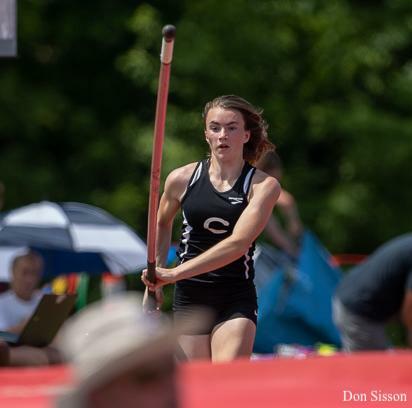 Centralia sophomore Lynsie Curtis made a major jump this season and capped off her sophomore campaign with a state title and Class 3 record. Her 12-6.25 mark was a quarter of an inch higher than the previous record set in 2014 by St. Clair's Emily Presley, a familiar name for anyone who has been following along with her Missouri Southern career (Presley is a three-time national champion in Division II now with a 14-6.5 personal best). It was a big jump for Curtis who had only cleared 12-0 once before this season and had a 10-6 personal best coming into the season. Curtis could be a name to watch moving forward as the "year of the pole vault" appears poised to continue into 2019. 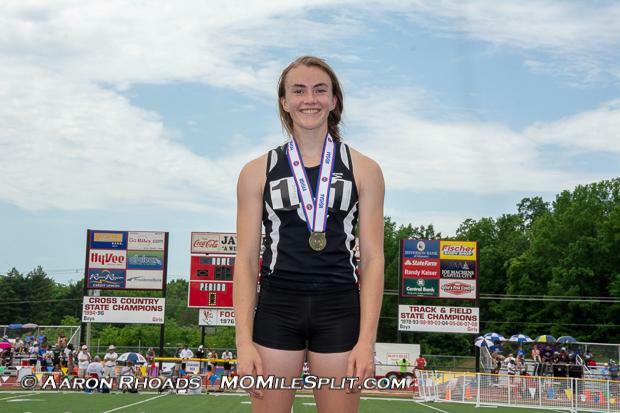 Hadley Jetmore: The Pembroke Hill freshman could be a major player in the next few years as she took second in the 400 and 200 and fourth in the pole vault and anchored the Raiders to a third place finish in the 4x400. Busiwa Asinga: The Principia sophomore will be another major player in Class 3 over the next couple of years after taking second in the 100, third in the 200, and winning the 300 meter hurdles. 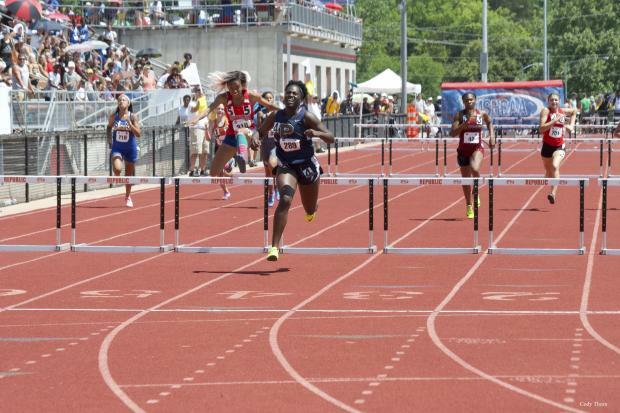 Lenetta Lee: A junior from Summit Christian Academy, Lee won the 100/200 double running 12.11 and 24.60. 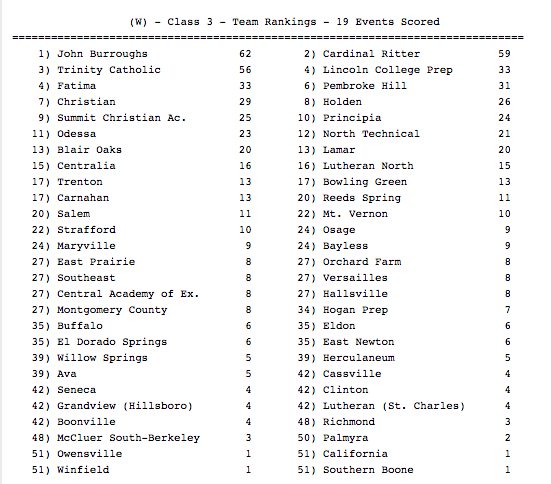 St. Louis showed up big in the the Class 3 girls team race. John Burroughs, Cardinal Ritter, and Trinity Catholic all finished within six points of each other and 23 points clear of the fourth place teams Lincoln College Prep and Fatima. John Burroughs earned big points from Kylie Goldfarb, Arianna Latuda, and Grace Gore, but were also helped along by twenty points in the jumps from Bria Ward and a second place finish in the 4x400. Cardinal Ritter got most of their points from Valarie Whitted, Sydney Mitchell, and Shayla Davis in the sprints, hurdles, jumps, and relays. Trinity Catholic also got big points in the sprints, jumps, and relays, particularly from Deayvion Smith and Sydney Juszczyk, who also scored 10 in the javelin. Lincoln College Prep got 20 of their points from junior Mikayla Deshazer who won both the shot put and discus. Nele Neal was fourth in the 300 meter hurdles and they also finished third in the 4x200 and seventh in the 4x100. Fatima's points were all from the distance events as they grabbed 21 of their 33 points in the 3200 with the other 12 in the 1600 and 4x800.